After my first year of college, I decided to do something different over the summer—read a lot of books. I used a portion of my Monthly Performance Reports to put my reading lists on full display. While I normally read 5-10 books in a given month, the summer days allowed that reading list to morph into 30 books every month. I didn’t take time off from my business during this time. In fact, I dramatically increased the amount of books I read while preparing to lead a Content Marketing Success Summit, one of the biggest projects of my life up to that point. In this blog post, I’ll share my story so you can reap the benefits of reading 30 books every month without feeling overwhelmed by work, your personal life, or anything else. Before I began my 30-book per month reading journey, I knew I needed to have all of the books readily accessible. So, to put it bluntly, I went on a bargain buying spree. I knew that by the time I finished reading any given book it would be filled with notes and underlines, so I didn’t mind buying used books (as long as they didn’t have any underlining or highlighting included). My adventure began on eBay where some people are desperate to part ways with their books. Because the bulk lots included anywhere from 10-20 books per order, I bought books at a rate from $1 to $4 per book depending on who was selling them. And all of these books were LEGIT, not aged books that are no longer relevant. In fact, I published several books before social media taught me the marketing tactics that work today (often overlooked in the new age of digital marketing). If you prefer to read books on a device, you’re all set. You can buy all of your books in a few clicks. I prefer reading paperback editions, which is why I decided to purchase books in bulk on eBay. The only problem with book lots is that you don’t get to choose the books on offer; I have multiple copies of the same books because they were a part of a bulk order. But eventually I learned about Thrift Books, which help you avoid that problem as well as enjoy a wider range of choices and ridiculous bargains. You may think it’s not worth going through the trouble to find book bargains, but if you want to read 30 books per month, that’s 360 books every year. In a worst case scenario, saving an average of $10 per book (very possible with book lots and Thrift Books) results in a savings of $3,600 every year! Once you have assembled all of your books, it’s time to read them. But don’t read them in the traditional word-for-word style. Sure, you’ll absorb all of the material if you do, but it will take a longer period of time before you move onto the next book. When I read books, I skim through them for the most pertinent information. If there’s a section that explains how to create a Twitter account, for example, I skip it because I already have a Twitter account. There’s no need to waste time reading things that you already know. Similarly, when I buy a productivity book I skip through familiar tips like setting deadlines, 3-Year Plans, and how to set SMART goals. Unless the author shares these common tactics with a very different flavor, I skip to the next part of the book. Not only should you skip over things you already know, you should also get into the habit of skipping portions, or even chapters, of books containing information you don’t want to learn. For instance, I don’t want to learn much about Vine because Vine is a dead social network. And yet, many of these books have entire chapters dedicated to Vine. Some books are dedicated entirely to the social network. Just remember that information that was once relevant may be outdated today. You can also skip chapters outlining tasks you don’t want to perform. For instance, I’ll skip a chapter in a podcasting book about editing episodes because I already have a trustworthy freelancer who edits my podcast episodes. Skipping that chapter allows me to move to the next chapter sooner and, ultimately, to a new book. For a long time I resisted writing in my books, especially signed copies. While I rarely write in books, I often underline with a pencil. Underlining important points in each of your books makes the re-reading process easier. 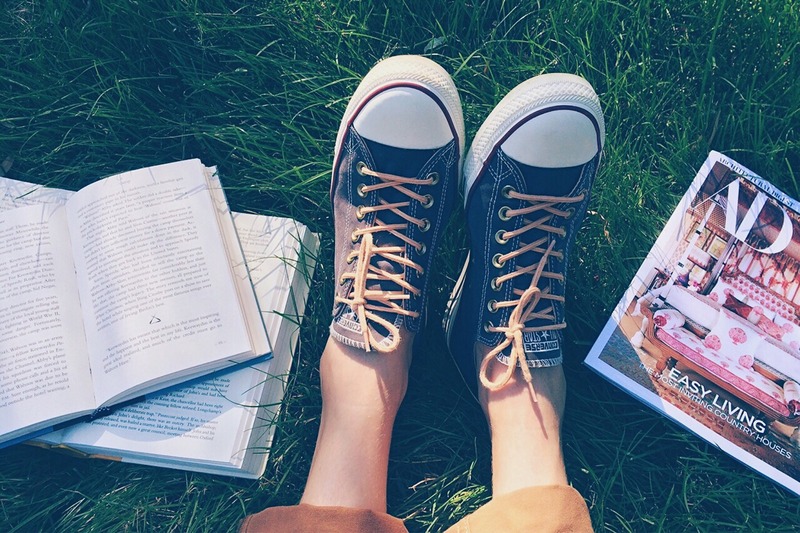 After all, you have a plan to re-read the best books, right? At the beginning of each month, I go through my favorite books from the previous month. I skim through what I underlined, and brainstorm ideas. I commit a few hours of one day to this task. Underlining important text makes this process much faster as I can literally skip hundreds of pages of content. I only focus on what I’d underlined previously because my past self regarded only those points as important. One thing to remember when reading 30 books in 30 days is that book length matters. It’s much easier to read 30 books that average 200 pages than to read 30 books that average 600 pages. When dozens of books are delivered to me in one day, I start by reading the shorter books first. It’s likely a good thing that I read Tools Of Titans before I began taking my reading goal seriously. I like reading the shorter books first because finishing a shorter book gives me the dopamine rush to start reading (and finishing) another book. Get a string of small wins, and it won’t be long before you can read the occasional 400-600 page book with ease. If you want reading to become a habit, you must schedule it into your day. I schedule at least one hour of reading time every day. You should also choose one day a week to dedicate entirely to reading books, no professional work. I designate Fridays as my reading days. And even though I spend several hours reading books on Fridays, it doesn’t feel rigorous. Why? Because Fridays feel like a day off from work. It’s important to find what works for you, but don’t forget that if it’s not scheduled, it won’t happen. Professional work can take up hours of your day, but so can TV and internet surfing. You need to eliminate digital surfing from your life because you’re simply watching life happen instead of making life happen. Spectators watch, superstars perform. The average American watches 32 hours of television every week. If we all switched from digital surfing to reading self-development books, the world would truly be a better place. The next time you want to watch a marathon, the last episode of a series, or reruns, crack open a book instead. Repeat the process with other bad habits, and with greater intensity, and you’ll have no problem reading 30 books in 30 days. Reading 30 books every 30 days will dramatically expand your knowledge and open the door to a variety of possibilities. Reading all of these books requires a mindset shift and the elimination of bad habits. And, of course, the 30+ books you’ll need on hand before you get started. What are your thoughts on reading 30 books every day? Have any good book recommendations for us? Please share how you plan to implement this habit into your own life. Sound off in the comments section below. The blogging habits we use to guide us play a significant role in our content marketing efforts. The most successful bloggers live by a series of habits that guide them through the world of blogging. Blog traffic comes easy to these individuals who enjoy hundreds of thousands of monthly visitors. As part of my New Year’s resolution to surpass 100,000 monthly visitors, I decided to analyze these successful bloggers to see what makes them tick. How do they surpass 100,000 monthly visitors, and how can I achieve the same results? With this in mind, I’ve written a blog post that details the habits successful bloggers use to attain their goals. There are five blogging habits you should develop if you want to become a full-time blogger. No one said blogging would be easy. This first habit is perhaps the most important because you can’t promote content until you’ve created it. Not only does writing content matter, but writing lengthy content matters, too. Most blog posts featured on the first page of Google search results exceed 2,000 words. Writing at least 1,000 words a day will give you a total of 7,000 words each week that you can dedicate to your blog. If you write 2,000-word blog posts, you’ll have at least three blog posts every week. However, some bloggers write even lengthier content more frequently and consistently. That’s why 1,000 words per day is the absolute minimum. But if you manage to write over 1,000 words, even better. Writing 1,000 words per day requires time, and time is more scarce than ever. So how is it possible to accomplish this goal every single day? The best way to free up your time is by outsourcing work to freelancers. If it weren’t for outsourcing, I wouldn’t be able to accomplish many other important tasks for my business. I simply wouldn’t be able to write lengthy blog posts, produce one YouTube video every day, create training courses, or write books. Many of my ventures would be sidelined if I tried to do all of the work by myself. And I’m always looking for more ways to outsource my business. The more you outsource, the more time you create for yourself. With that said, you also need to use your own time productively. Many distractions will try to keep you from writing 1,000 words each day, but with practice, you can overcome them. Most distractions are a result of bad habits. The best way to eliminate these bad habits is to replace them with better habits such as writing more content for your blog and reading books during your breaks. Plus, writing 1,000 words a day will make you a better writer. Value will begin to come naturally. The challenge is to write valuable content even when you’re pressed for time. For every blog post you publish, you should conduct a massive amount of research. In the past, I would write lengthy blog posts without doing research, and then wonder why I wasn’t getting any long-term traffic. But ever since I’ve added research to my content marketing efforts, my traffic has gone up. Many of the top bloggers I analyzed conduct hours of content research just to write one great blog post. And it makes sense because linking to great content benefits both you and your readers. Your readers are getting higher quality content (and are more likely to share it), and you get more search engine traffic. Talk about a win-win. And there are more benefits to linking out than just that: Here’s the complete list from SEO Moz. Each time you write a blog post, expand upon it by linking to other relevant blog posts found that help strengthen your content. Adding these links helps your blog grow, regardless of whether the links lead to your own content (internal links) or to someone else’s content (external links). The benefit of internal linking is that people will spend more time on your blog, lowering your bounce rate (likelihood of someone leaving after viewing one page/post on your blog). And a lower bounce rate will help your SEO efforts. External links to high-authority sites let search engines know that your blog also has authority. Since you’re promoting quality content, search engines think your content must also contain value, pushing it higher up the search engine rankings. Content research takes a significant amount of time, but you’ll end up with a more valuable blog post. Readers will engage with it for longer periods of time and you’ll get more traffic. I like to Google my way to the articles that I link to in my blog posts. And sometimes I use other tools for my content research. Conducting content research becomes much easier as you spend more time writing content and engaging with people in your niche. Have you ever finished a blog post only to realize that it’s too short for search engines? I have, several times, but not anymore. Before I reveal what I did differently, I’ll tell you what I was doing wrong. For a blog post like this, I would have come up with the title and jotted down the five tactics I intended to mention within the post. While this approach made it easy to crank out content, I’d often get stuck at a little over 1,000 words. Sometimes I’d fall short at 800-900 words. Now that never happens. Why? Because I ask myself questions that naturally make my content longer. Socratic questioning (asking yourself questions) is a form of conversation that has been used for thousands of years, and it still works today. For all of the tactics I discuss in this blog post, I asked myself three questions. When asking these questions, I saw myself as a reader who wanted to learn as much as possible from this blog post. What are three things people want to know about this particular tip? What would they ask? By anticipating these questions in advance, I no longer have to worry about word count. Since I focus less on increasing word count, I have more time to focus on providing a better experience. •How do I market myself most effectively? •How do I make it easy? Keep this outline in mind when we get to the 80/20 rule. Asking three questions definitely adds time to my outline process, but only by about 3-5 minutes, and it’s worth it when you consider my final draft. So I may spend 5-10 minutes expanding upon my outline with thoughtful questions, depending on how long the outline is to begin with. But, in every case, it never takes an entire day. I just write down the first three questions that come to mind. If I struggle to think of a third question, I leave it alone and address the next portion of my outline. I don’t want to sit around and ponder because I know I’ve got a behemoth of a blog post ahead of me. The cool thing about using Socratic questioning is that you turn each of your tactics (or in this case, habits) into a mini blog post. You’ll want to write a blog post that contains a series of mini blog posts all wrapped up into one because that’s how you provide massive value that ranks well with search engines. Creating an outline like this is easy. Writing the content is simple, albeit time consuming. But the more time you open for yourself, the more you serious you are about blogging. The 80/20 rule is also known as Pareto’s Principle. With this principle, 80% of your results come from 20% of your efforts. This 80/20 rule for blogging slightly different. It asks that you spend 80% of your time marketing your content and only 20% of your time actually creating content. Thus, if it takes you an hour to write a blog post, you should spend four more hours marketing it. And since the Socratic questioning technique mentioned above increases your writing time, your marketing time will also increase. Of course, you can skip the marketing all together, but you won’t get very far with your blog. There’s simply too much content, and competition, on the web. You’re not just creating content. You’re creating a content brand. And just like any other business, your brand needs effective marketing to become a surefire winner. Successful bloggers write a bunch of epic blog posts, but their marketing efforts are why we end up reading them. Most of the efforts you’ll make as a successful content marketer involve connecting with other bloggers. In an interview, Neil Patel explained that, when he was getting started, he would contact anywhere from 400-500 people about his new blog post. He asked each person to share his latest blog post. Neil found these people using BuzzSumo, his go-to content marketing tool (he refers to it as God’s Gift To Marketers). BuzzSumo lets you see everyone who has shared popular blog posts in your niche. You can then contact these people and let them know about your own blog post. Of course, you can try to hunt down these people on social media, but it’s much more time consuming. The best way to do it for free is to use a social network’s search engine and search a blog post’s title. Here’s what it would look like on Twitter if, for example, you wanted to search for my guest post 5 Ways To Flood Your Blog With Traffic Using Pinterest (currently my most successful guest post). However, this strategy takes FOREVER and BuzzSumo does the same thing much faster. If you can fit $99/mo into your budget, BuzzSumo is a worthwhile investment for your content marketing efforts. Regardless of which option you use, contacting hundreds of people involves a lot of work on your part. The best thing you can do to cut down your work time is to create a rubric message. Rather than re-write the same email over and over, you can simply copy and paste the body of the email and change a few things to personalize it (addressing each person by his or her first name, for example). Successful bloggers constantly read other people’s blogs. If you look at any of their blog posts, you can tell they’ve read several other blog posts on the subject before finishing their own. You wouldn’t be shocked to hear that authors read several books before writing their own. So it should come as no surprise that bloggers read several blog posts before writing their posts. Sometimes a blogger will write two blog posts back to back, but even then, intense research goes into each one. The research is based on blog posts that were read in advance. However, successful bloggers don’t just read any blog on the web. They read blogs related to their niche. They want to gather as much insight as possible. But they also want to see what’s working for audiences in their niche. Which pull-words result in more engagement? How is this blogger getting more shares? How is the blogger making revenue? Successful bloggers ask themselves all of these questions, and they find the answers by conducting research. During this exploration, more content ideas emerge. And it’s easier to learn something when you actively write about what you are learning. By repeatedly writing content about subjects they want to master, bloggers eventually become experts in their field. Try to read other people’s content for at least 30 minutes every day. The great thing about blogs is that they’re available online as compared to books (unless you read eBooks, but I prefer paperbacks). If you have your smartphone with you, you can easily search for blog posts anytime you’re waiting for something to happen. Read a blog post while you’re waiting for a performance to begin. If you are waiting for an Uber driver, read a blog post until he shows up. As you read, take notes on what you learn and write down content ideas as you go. That way, you’ll be armed with more knowledge that you can refer to within your next blog post. The most successful bloggers spend hours upon hours in a given day on their blogs. They treat their blogs like a full-time brand because that’s exactly what they are. You may only be able to commit to your blog part-time, but you can still live by these blogging habits. A blog post like this is a lot to soak up in one sitting. However, you can always start small and build upon these success habits. Habits by nature are obtained through gradual development. Out of every success tactic I came across during my analysis, contacting 400-500 people for each of my blog posts seemed the most daunting. Why does it have to be 400-500? Why not start with 10? You can then inch your way towards 20 people, 30, 40, and gradually make your way to the 400-500 threshold. Neil no longer contacts 400-500 people every time he writes a new blog post. Why? Because he doesn’t have to. But when he was just getting started, he made those contacts in order to build momentum. All of these habits will become easier over time and yield greater results as you exert more effort towards each. Which of these habits do you think is most important? Do you have a 6th habit for us? Have a question for me? Leave a comment now. I read them all! And if you know anyone else who needs this burst of insight, please be sure to pass it on. 5 #Blogging Habits That Will Turn You Into A Full-Time Blogger. If you’re new here, join my mailing list using the form below. You’ll get a ton of free content just like this.